Here’s something to celebrate: new music. 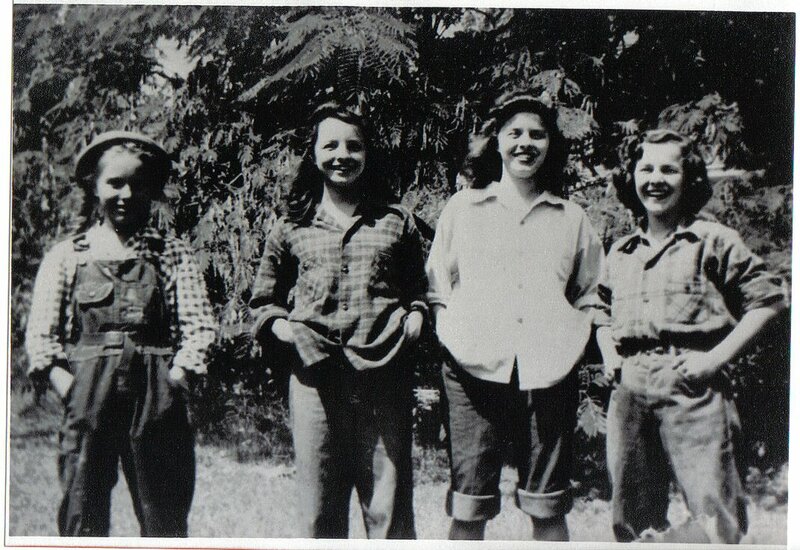 I grew up (that’s me with the pigtails, c.1944 in our Ashland, VA back yard; I was very proud of that Girl Scout belt) to my older sisters’ big band dances, jazz and gospel and symphonies on the Victrola; they grew up to be serious musicians and one very accomplished artist. Recently I’ve gotten to know Carla Kihlstedt and her music. Went to hear the new 2 Foot Yard prepared to enjoy it, absolutely loved it. Then when guitar-percussion-electronics guy Shahzad Ismaily started talking in his gentle, quiet voice about recently lost loved ones and how life is short and death is certain and it is vitally important to enjoy every moment and be kind to those you love…. I was hooked. I was unexpectedly also hooked on Ara Anderson and his Iron & the Albatross group. Ara’s a “multi-instrumentalist” (a whiz on trumpet which I think is his #1.) The “multi” includes a toy piano, and Charlie Brown never sounded better. I’ve heard Carla do extraordinary new music, most recently premiering the last, great piece by the late Jorge Liderman with the San Francisco Contemporary Music Players — the kid can do it all (she calls herself musically schizophrenic) — and still remember being introduced to San Francisco with her Charming Hostess group at the Bottom of the Hill. Those gigs are always fun partly in that my husband and I raise the median age of the audience by about 40 years. Still, the celebratory thing is that so much music — Mozart, John Adams, Frank Sinatra, John Denver, Duke Ellington, Carla Kihlstedt — is in the air, getting more joyful all the time. Especially if someone like me can delight in it all. Hi Fran, A friend told me about your blog and I must say that you are an inspiration! I will certainly be following your entries now….I don’t know how old you are but you act and write like a spring chicken. Keep it up!